English Christian Orientalist and theologian; born at Oxford Nov. 8, 1604; died there Sept. 12, 1691. He studied Oriental languages at Oxford and elsewhere; was chaplain of the English "Turkey Merchants" in Aleppo from 1630 to 1636; and became professor of Arabic at Oxford in 1636. He spent the period from 1637 to 1640 in Constantinople, and on returning to England in 1647 resumed his professorship of Arabic at Oxford; he became professor of Hebrew, also, in 1649, which position he held until his death, although frequently attacked for political reasons. During his stay in the East he collected many valuable manuscripts, among them one of the Samaritan Pentateuch. 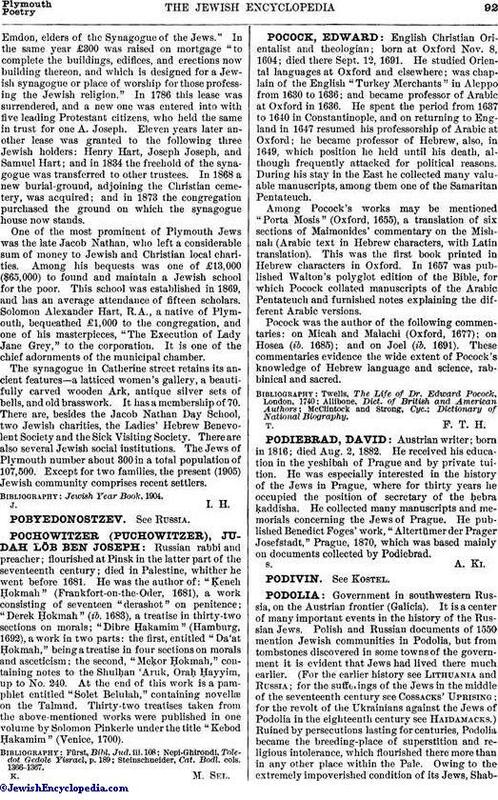 Among Pocock's works may be mentioned "Porta Mosis" (Oxford, 1655), a translation of six sections of Maimonides' commentary on the Mishnah (Arabic text in Hebrew characters, with Latin translation). This was the first book printed in Hebrew characters in Oxford. In 1657 was published Walton's polyglot edition of the Bible, for which Pocock collated manuscripts of the Arabic Pentateuch and furnished notes explaining the different Arabic versions. Pocock was the author of the following commentaries: on Micah and Malachi (Oxford, 1677); on Hosea (ib. 1685); and on Joel (ib. 1691). These commentaries evidence the wide extent of Pocock's knowledge of Hebrew language and science, rabbinical and sacred. Twells, The Life of Dr. Edward Pocock, London, 1740.